When the kingdom’s most wanted—and most charming—bandit Flynn Rider (voice of ZACHARY LEVI) hides out in a mysterious tower, he’s taken hostage by Rapunzel (voice of MANDY MOORE), a beautiful and feisty tower-bound teen with 70 feet of magical, golden hair. Flynn’s curious captor, who’s looking for her ticket out of the tower she’s been locked away in for years, strikes a deal with the handsome thief, and the unlikely duo sets off on an action-packed escapade, complete with a super-cop horse, an overprotective chameleon and a gruff gang of pub thugs. Tangled is a story of adventure, heart, humor and hair—lots of hair. 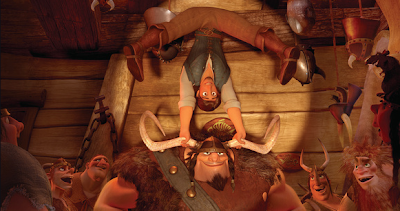 Featuring unexpected heroes, magic, laughter and adventure, this animated feature is supported by an amazing cast of voice talents including Mandy Moore (“A Walk To Remember,” “The Princess Diaries”) as Rapunzel, Zachary Levi (TV’s “Chuck,” “Less Than Perfect”) as Flynn Rider, Brad Garrett (TV’s “Everybody Loves Raymond,” “’Til Death”) as Hook Hand Thug, Donna Murphy (“Spider-Man 2,” “The Fountain”) as Mother Gothel, and Ron Perlman (“Hellboy,” “Hellboy II: The Golden Army,” “The City of Lost Children”) as the Stabbington Brothers. From directors Byron Howard (“BOLT”) and Nathan Greno and the award-winning songwriter of “The Little Mermaid” and “Beauty and the Beast,” Alan Menken, TANGLED’s hair-raising adventure keeps viewers entertained throughout with its exciting storyline and memorable melodies. 9 Tangled Teasers – A collection of the most unique and quirky commercials made for the theatrical release of “Tangled.” Some are spoofs based off of infomercials and/or breaking news, some are teasers and others are simply just funny filmstrips. The kid's (and us) absolutely LOVED Tangled in the Theater! 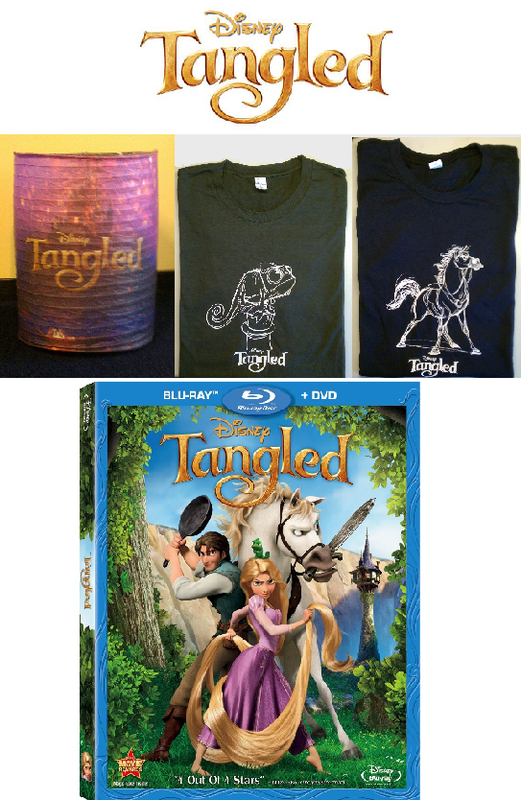 We have been hearing a steady stream of "can we get it on DVD" since the day we took them to see it....so you can only imagine their delight when we received the Tangled Blu-ray + DVD Combo Pack the other day. We had an impromptu movie night early in the week as they couldn't wait till Friday, they NEEDED to watch it right away! I quickly remembered why this film was such a hit; the animation is simply breathtaking. With a beautiful storyline reminiscent of the classic story Rapunzel, it captivated all of our attention (once again) as we watched the beautiful girl discover life outside of her tower with her unlikely hero, Flynn. As the two set off on a Journey to view the mysterious lanterns that are released every year on Rapunzel's Birthday, the pure adventure kept the kids totally engaged in the movie. Speckled with comedy (Maximus and Pascal are quiet the comedic duo), the inspiring adventure that unfolds in Disney's Tangled is one the entire family is sure to enjoy.....I know ours did! 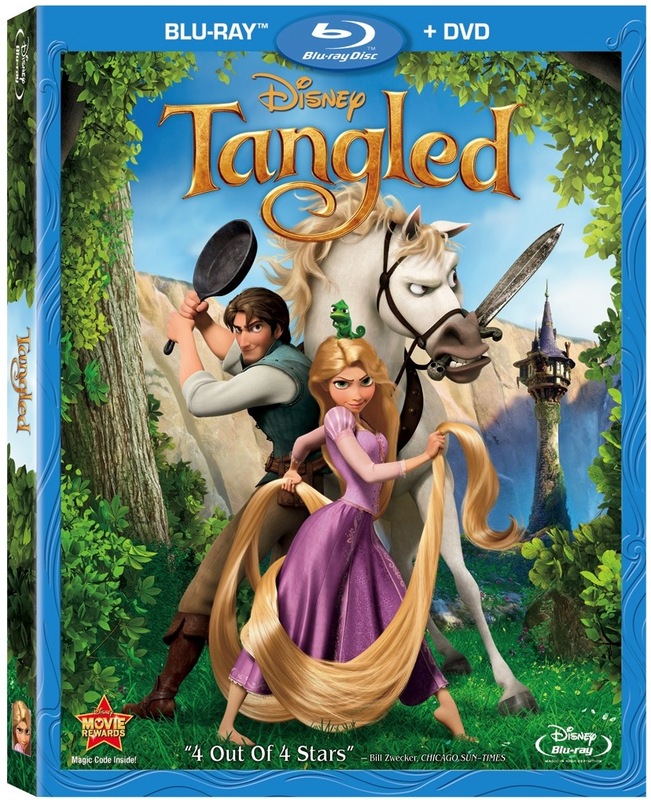 Disney's Tangled Debuts as the Ultimate 4-Disc Disney Blu-ray™ Combo Pack on March 29, 2011! 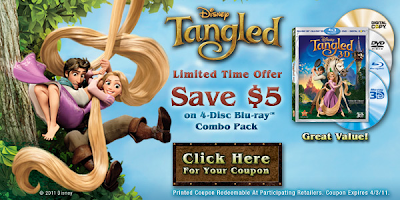 Click Below to Print a Limited Time Only (Expires April 3,2011) Coupon for $5 Savings on a 4-Disc Blu-ray Combo Pack! 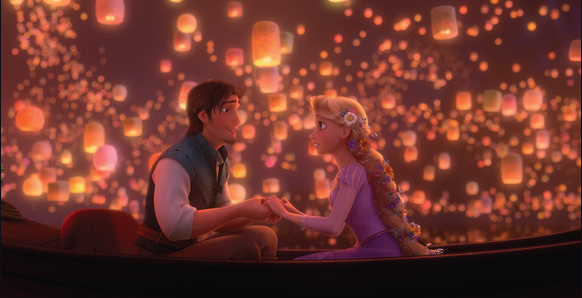 Disney's Tangled Debuts as the Ultimate 4-Disc Disney Blu-ray™ Combo Pack on March 29, 201. Look for it at a retailer near you!. You can also pre-order your copy at http://www.amazon.com/. WIN IT:One Lucky Reader will receive a Disney's Tangled Prize Pack! 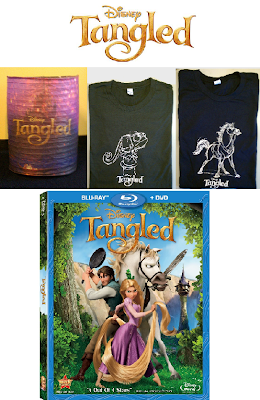 (Pictured Above) Includes Tangled Blu-ray + DVD Combo Pack, 1 Adult Maximus T-Shirt, 1 Adult Pascal T-Shirt, 1 Disney Tangled Paper Lantern! Leave a comment~ Which Tangled Character does your little one love most? The comment is considered you entry. Entry to this giveaway ends at 12pm PST April 1, 2011. Winner's are chosen randomly through random.org. Winner's may not have won a previous Enjoy Lighting Giveaway. The winner will be announced in a post within 7 days of the giveaway ending, and contacted through email. The winner will have 48 hrs. to respond or another winner will be chosen. I follow you on twitter. My daughter loves Rapunzel she would really love. follow you on Twitter Rapunzel is my daughters favorite. 1. I entered the PackIt Giveaway. 2. I entered the PackIt Giveaway. 3. I entered the PackIt Giveaway. 4. I entered the PackIt Giveaway. 5. I entered the PackIt Giveaway. Repunzel of course! GD has already told us that she wants that costume for Halloween this year! My nephew loved Maximus! So cute! My daughter loved Rapunzel of Course! My son loved Maximus the horse! Subscribed to your Newsletter. I am thinking that I am subscribed to the newsletter o.k. If I can view it, doesn't it mean that I am subscribed? My daughter likes princesses...so, she really likes Rapunzel.